The King of the Pigeons (Ftrain.com) . A note from the future Emperor of New York City. I will savage you, filthy sky-rats! There will be nothing left unless you surrender to my will as emperor of New York City! Even though the public may not be able to understand the words sent in my direction, I have, in my anonymous exile here in Yorkville, been much cheered to hear them. By carefully observing your pronouncements on NY1, The New York Times, and especially the New York Post, and using the agreed-upon ciphers to decrypt those pronouncements, I have been heartened to learn with what full heart each of you supports my sacred rights. It has been a source of joy to me that each of you (particularly you, Borough President Markowitz) has worked so dutifully to pave the way for my ascension to the throne. Now it is time for me to remove my plain clothes and put on the robes of office, and bring a new era of prosperity and pride to this empire city, in the empire state. Your toil is almost done (but only almost! ), and your coded messages can soon stop, for we will soon come face to face in triumph. I am aware that each of you speaks to me without hearing the words of the others, so you too may not be aware that such a propitious era will soon come into being. But I assure that it will. And yet, before I can ascend to the throne, I have an urgent order of business, which must be addressed before I can claim my office. It is a matter of politics with the pigeons, who have started to rebel against the glory of my office and refuse to credit my rights to the throne. The pigeons must be brought to heel, and so serve as a reminder to all of the animals that there is only one true leader of New York, and I am he. I will explain my reasons below. Do you remember when, in my disguise as a regular citizen, I first arrived at each of your offices and presented to each of your secretaries a small piece of brown paper, no larger than my thumb, and written on that paper, in miniscule coded script, was news of my royal heritage, and explanation that I would soon be named as Emperor, and an explanation of how I would henceforth be listening for your signals in your public messages in newspapers and on television, and would wait for your word that preparations for my ascension had been completed? I am sure you have often wondered why I waited until that day—October 15, 2002—to contact you. The reason was simple: I did not know myself, until October 1, 2002, when the king of the pigeons of four boroughs had not contacted me to tell me that I would be Emperor. This is how I learned that I was to be Emperor of New York. I was performing my work as the secret historian of the city, carefully reading the Wall Street Journal for those messages which are directed to the city's current rulers, those men who work in downtown Manhattan who peddle their influence, and gild their boy-whores, and use secret monkey-language to keep me from my throne, and thus deny me my future as the savior of the poor. Namely, I was going through the stock listings, decoding the numerals there into messages so that I could see the secret machinations of those poorly-bred plutocrats, a painstaking effort in which I spend the greater part of my waking hours during weekdays. As I proceeded to this work, the window was left open, because I have a landlord (whom I shall exile to Yonkers when I have claimed my rights), and this landlord keeps the heat at insufferable temperatures, if it works at all. And so, although the night was cool, I had my window open wide, and arrayed around my notes, which are painstakingly written in a code to which only I have the key, I kept a small model of Stonehenge made of bits of foil and paper. It is my hobby to model great monuments of the world from what other people see as garbage. I have built the great heads of Easter Island from wheat paste and newspaper, and reproduced the pyramids in biscuits. But despite my attempt to shellac and preserve my efforts (in a similar manner to those pizza restaurants which offer butter-bronzed calzones and other items for display behind their counters), the mice found their way to these tombs and devoured their way through them—most fitting, as the same happened to the pyramids themselves at the hands of thieves, and what are mice but a caste of thieves among us, squeaking and rubbing their paws, ever penetrating our most fortified defenses? As I was saying, the window was open, and into the middle of my latest project, my Stonehenge of tinfoil, there suddenly flew a pigeon. Landing as he did, scaled up against the tiny Stonehenge, he looked like a terrible roc about to devour a passing sailor. He bowed before me, his head bobbing. And to my surprise, he spoke. I have, of course, spoken with animals before. Often they do not speak back, although when I was a child of Queens the rats once asked me to serve as ambassador to the cats, but I would have no part of it—the rats are treacherous and get what they deserve. But I had never thought to speak with the birds, because I did not want to be considered crazy. What did this pigeon say? I cannot tell you all of it, for even though I have decided to no longer favor the pigeons with my protection, I am a man of honor and this pigeon did speak honorably and in strict confidence (I will offer some details below, however, so that you might understand the great consequences of this meeting). I will summarize. The pigeon said that he was the king of the pigeons in Manhattan, Queens, Staten Island, and the Bronx. Brooklyn, he said, was run by a different pigeon king. The organization of the pigeons is planned, for reasons not entirely clear, exactly as the organization of the public library system in New York City, in which 4 boroughs share a library system, and Brooklyn stands alone. But he said that he was on good terms with the pigeon king of Brooklyn, and while he could not speak for him, his influence would be felt if we were to come to some conclusion regarding the matters of which he had to speak. We have cast the seeds to see the future, he said, and the signs point to your rise as the future emperor of New York City. And we have come to you at the earliest appropriate time to pledge our allegiance to your cause and to put ourselves at your service. Imagine that my heart stopped! Imagine that it leapt into my throat, and from my mouth, and went running around the room, and turned on the cold water, then the hot, and stopped at the fridge for a sandwich, then came back in, then went back out to put more mustard on the sandwich, rested on the sofa for a short time, and finally re-entered my body. For years I had woken sweating from the same dream, one in which I was brought to the city hall steps and invested with the robe of imperial office, of 5 different colors: gold, purple, royal blue, red, and green, representing each of the boroughs, handed a scepter topped with the Empire State Building, and crowned with a golden tiara with reliefs of all the major bridges, after which Robert DeNiro embraced me and gave over all rights as acting chamberlain. I had no inkling of what these dreams meant, and never dared to tell anyone about them, and due to my diminished circumstances and the recurrent problems with my neighbors, regarding the noises they make and the words they mutter as they pass my door, and the strange curses they aim towards me, and the voodoo feathers they push under my door, and the way they manifest lights in my mind while I am sleeping, I have few friends aside from the local librarians, and I did not dare tell them that I dreamt of being their emperor (librarians, by their nature, and not loyal). And yet here was an emissary from the winged world, telling me that my dream was simply an unmanifested reality! That it was not simply the effect of coffee before sleeping, but a prophecy. Suddenly everything made sense in my life (the serenditous connections which have led me to conclude that I am emperor I will detail in a different message), and I felt finally, just as my mother told me while she slowly stroked my naked body with palm fronds and gently kissed my neck, before my father burst in with a club and dashed her brains out into my naked lap, then sullied me in a way unmentionable and then leapt from our 9th floor window onto the sidewalk, where he was run over by an Apple Tours bus, during a warm summer day when I was freshly home, at the age of 26, from a CIA-sponsored, heavily armed journey to a jungle village on a continent I cannot name without betraying an oath, where I had hunted both man and tiger—well, as my mother told me, I felt that the Gods had a special purpose for me. I forgave him this indiscretion, for he was clearly exhausted, and badly ruffled. Finally, he made clear the reason for his visit. “Though I have sworn fealty to you, my kingdom is lost, and despite prophecies, the pigeon-king of Brooklyn refuses to acknowledge that you are the true owner of the throne of Emperor of New York City. And therefore the support which I promised you I cannot provide, and I must leave you to attain the throne on your own.” And he flew off, but not before we exchanged a tender farewell and I promised to return him to his throne were I to be made emperor. I suppose it does no harm to describe what he promised me, now. He offered a full flock of well-fed pigeons would serve as my personal guard whenever requested, which would soil my enemies terribly, and peck them if requested, and he promised to provide me with message-carrying service in areas of New York poorly services by cellular phones. In return, I was to create an Order of Knights Aves (note the pun on avenues! ), to which pigeons of high rank and excellent service could be elected. But it is not to be! And where before, when I came upon a flock of pigeons, they addressed me with hushed cooing, now they ignore me entirely, or fly away. I attach a picture in which they have turned their backs to me. And so, how are we to address the pigeons? They must be loyal if we are to create this empire and bring it up from what it once was. And we must strike now, before I take power, we will set an example and diminish the violence of my ascension. In particular I think of the rats, who will see an opening and seek to challenge my power if we leave the pigeons unmet. If this city is not to be run by vermin, we must take action. I myself have begun my campaign. In the last few weeks, whenever I come across a flock of pigeons, I rush into them screaming “serve the emperor!” They fly away immediately in terror, and I believe the word will spread among them that they must respect my office. When I do this, however, those human subjects watching me turn away from my shouts, and walk some distance as if they are afraid of me, but I know that they do so because they are ashamed to see their emperor—for I do believe that many of this city's citizens have been informed by the pigeons and their compatriots, before the ousting of the last pigeon king, of my existence; I cannot be the only man to speak with the pigeons, and I increasingly feel all eyes upon me as I stroll down the various avenues of the city—because they are ashamed, I say, to see their emperor reduced to facing the pigeons in his own person, with no troops to support him, and they feel themselves bested by the pigeons, as well. This will be the first trial of our new government. I have set the example, but now we must all go bravely into flocks of pigeons, shouting and waving our arms, and ignore their pecking and soiling. I know that Brooklyn Borough President Markowitz will do this admirably, and I expect all of you to follow his example. If this avenue of action is not conclusive, we will proceed to poisonings and the use of small firearms, such as the 9 mm pistol I have been forced to carry upon my person to protect my security (the risk of attention brought by bodyguards is too great, and my treasury, as it is, is badly depleted, so I make do). 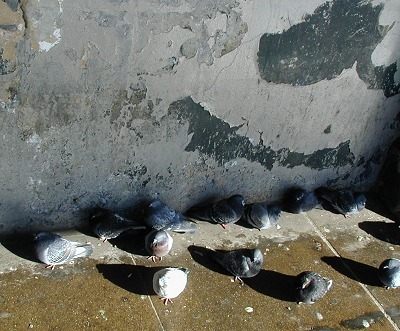 To this end, I have captured some non-cooperating pigeons and applied the pistol to them, and found that where before there was a pigeon, there is yielded an atomized, thin cloud of elements. But I assure you that the first approach is the one I advocate: let us first scare the pigeons, and force them to terms, before we slaughter them wholesale with semiautomatic rifle fire during the busiest times of the day on crowded subway platforms while stripped naked and screaming “I am your emperor!” But let us also not deny ourselves any potential course of defense from this offense by the birds. We must succeed! Then, when the king of the pigeons of all boroughs has sworn his loyalty (or been deposed by any means available), we will draw on the force of that victory to announce my ascension to the throne, first to the rats, who will concede the throne if they see the pigeons bested, for while they are great in number they are weak in spirit, and once we have the rats and pigeons behind us, the people will be sure to listen and see that my claim is justified. This is The King of the Pigeons, a work of fiction by Paul Ford, published Friday, January 30, 2004. It is part of Walking/Riding, which is part of Semiautobiography, which is part of Story, which is part of Ftrain.com.